A truck driver was heading down the highway when he saw a priest at the side of the road. Feeling it was his duty, he stopped to give the priest a ride. A short time later, he saw a lawyer with a briefcase on the side of the road and aimed his truck at him. At the last second, he thought of the priest with him and realized he couldn’t run over the lawyer, so he swerved. But he heard a thump anyway. Looking back as he drove on, he didn’t see anything. Population change is a key factor influencing local retail sales performance. From one year to the next, area population gains or losses alter the number of potential shoppers in the region. In the longer term, population trends reflect the general economic climate of the region. Population growth suggests a more favorable retail environment, while population decline may be an indication of area economic stress. 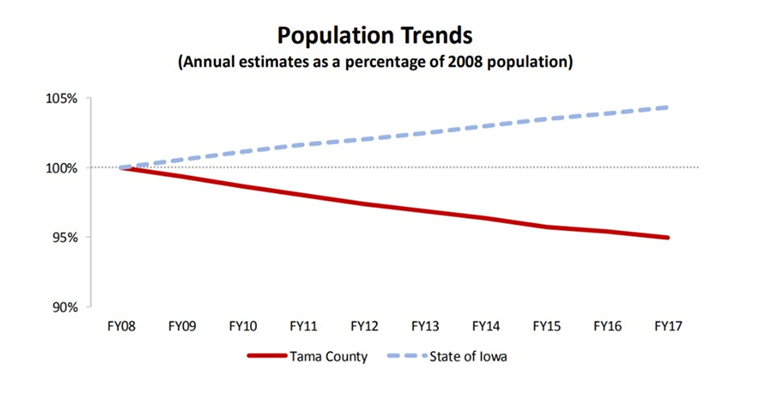 The chart below shows annual population estimates for Tama County and the state indexed to baseline values from ten years ago. The population in any given year is expressed in percentage terms compared to the base year population. This loss of population is beyond frustrating when you stop and realize that with a population of 17,119 Tama County added over 850 jobs in 2014 with the addition of Iowa Premium. Let that sink in–we added 5% of our population in new jobs and we continue to lose population. David Peters, an associate professor and Extension rural sociologist at Iowa State University says “The metro area population continues to increase”, with Iowa’s population growing by 0.41 percent in 2016 (putting the latest figure at 3,134,693). With the population growing, it means the population has moved within the state. These numbers add up to indicate Iowa is slowly turning into an urban and suburban state. Peters says 59.3 percent of the population is now living in metropolitan areas, and metro areas grew by 0.93 percent. Most rural areas continue to drop in population, with a few exceptions. Tama County could be one of those exceptions if we create new housing for the 5 percent of our population that only work here.